It's a table, it's a whiteboard... it's a Markerboard table! Putting dry erase markerboards on horizontal surfaces is the latest trend in school and office furniture. Tables and desks from preschool to the executive boardroom are now being outfitted with a dry erase surface for notes, memos, reminders and fun! The dry erase markerboard top is perfect for quick notes during a group brainstorming session and are often found on collaborative desks. Teachers may choose to have all student desks markerboard ready, or just a single desk in each desk pod so that they can assign a single note taker. Many teachers are adding a dry erase markerboard table to their classroom for one-to-one demonstrations in math, science, engineering or any subject. Office conference tables, media tables and co-working tables are also being designed with markerboard tops so that workers can take meetings to a more granular level with lists, notes and specific takeaways. It's not permanent, but simply snap a photo of the table when you're done to share the outcome of any brainstorming session. Dry erase tables and desks are most commonly available with a white surface, but there are colored markerboard tables too. What to stand instead of sit? 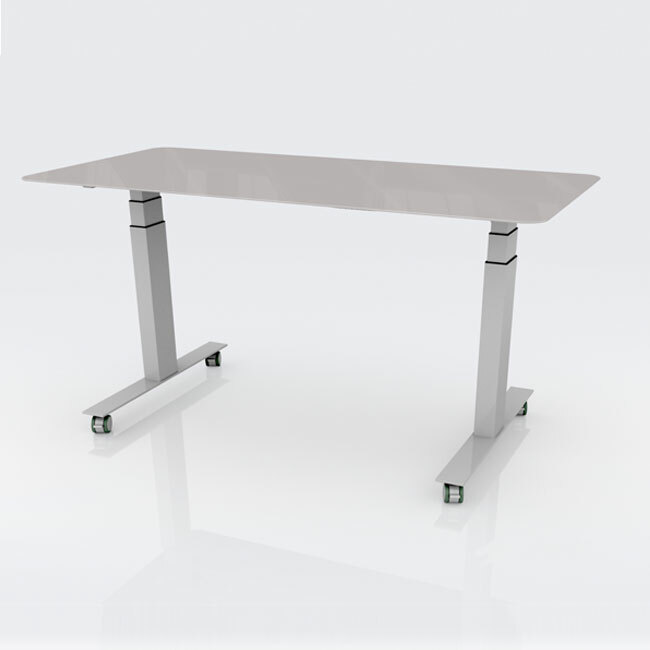 There are many standing height dry erase top desks and tables available to best suit your work or educational setting. Find a table that you like, but don't see a whiteboard top option? Just contact us to see if it's available with custom top, or we can suggest a similar table that does. More and more markerboard tables and desks are being added all the time to makerspace rooms, libraries, classrooms, meeting rooms and preschools. For fun or for some serious notetaking, make sure you have a dry erase table or desk available for your staff or students. We also have traditional wall mount whiteboards and freestanding mobile boards for all of your communication needs.